The DOT commissioner told an audience at New York Law School that buses would get priority of some sort but didn't commit to a high-capacity transitway that can operate without interference from private motor vehicle traffic. Speaking this morning at New York Law School, DOT Commissioner Polly Trottenberg ruled out making 14th Street a transit- and bike-only route during the L train shutdown. While Trottenberg said buses would get priority of some sort, she left a lot of wiggle room and didn’t commit to a high-capacity transitway that can operate without interference from private motor vehicle traffic. Trottenberg said that 14th Street will “have to accommodate tens of thousands of people” but gave the impression that a high-capacity transitway is negotiable. “We are doing a very careful traffic analysis that’s looking at the whole network, not just 14th Street, and trying to come up with a very balanced plan,” she said, “where there may be parts of 14th Street at certain times of day we’re going to have bus-only access, but it’s not going to be no cars, no loading, that’s not our plan.” DOT is thinking of adding bikeways on smaller parallel streets, she added. Trottenberg may have been playing to the audience here, but given the urgent need for surface transit capacity during the L shutdown, it’s discouraging that she downplayed the importance of providing bus service that can carry as many people as possible on 14th Street. If a few cars are allowed to impede the path of buses, that could seriously degrade the quality of service. That is what the “advocacy community” — which includes people who live and work around 14th Street and see an opportunity for major improvements to their daily lives — has drawn attention to since the L shutdown was announced. The ranks of supporters for a car-free “PeopleWay” dedicated to biking, walking, and transit include likely soon-to-be Council Member Keith Powers. Whether Beitchman and other residents of parallel streets agree or not, high-capacity bus service is essential to keep L train riders moving when the subway goes dark for 15 months. Without a clear path on 14th Street, buses will crawl, leading more people to opt for cabs and personal cars and swamping other crosstown streets. Loading and deliveries have to be accounted for too, of course, but that aspect of the plan can be ancillary to the core goal of providing reliable transit for very large numbers of people. Trottenberg’s response suggests all considerations will be “balanced” instead of making excellent surface transit the clear top priority. Absolutely fine if you choose not to. However, thousands of cyclists will choose to ride 14th Street, and we need to make sure that the infrastructure allows them to ride safely. Smart street design will allow for bus lanes, protected bike lanes, and expanded sidewalks. 12th streetes are not short sighted; we already have horrific trafic on a residential block. What the “advocates” should support is eliminating parking on 14th street and making that lane a dedicated bus lane. With buses in their own lane, not pulling in and out of traffic, buses will move faster and so will auto traffic. I’m not an insider. The pedestrian thing is obviously nonsense, but there may be merit to the point about truck size. Smaller vehicles are economical when either the cargo is valuable enough to forego the benefits of scaling up or when logistically larger size is a hindrance. Example: delivering fresh seafood to some restaurants isn’t likely to require an 18-wheeler because you probably can’t deliver fresh seafood enough to justify such scale. Even if the truck fits, why waste the fuel? 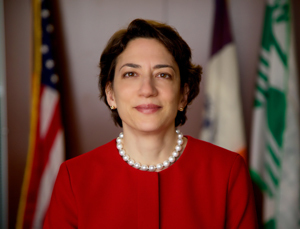 Last week, Schwartz sent an ultimatum to DOT Commissioner Polly Trottenberg demanding an "environmental impact statement" for the city's L train shutdown plan.